← Rent Or Buy? A Question For These Times. It’s an enduring stereotype: Cops eat donuts. Some members of the Westport Police Department very well may. Others may not. But our police are not caricatures. They’re great, hard-working, community-minded men and women, each with an individual story. Sometimes that gets lost in stereotypes. Westporters can get to know a few of those individuals next Wednesday (October 3, 7:30 to 9:30 a.m., Aux Delices, 44 Church Lane). The WPD is participating in “Coffee With a Cop” — a national initiative to strengthen bonds between officers and local residents. Westport Police do plenty of other community outreach: K9 and “Officer Friendly” outreach in schools and daycare centers; youth activities like Dodge-a-Cop and bowling; teen and adult Citizens’ Police Academies, and an ice cream social on Jesup Green. Aux Delices is a perfect place for Wednesday’s casual get-together. They serve great coffee, and an extensive breakfast menu. This entry was posted in Downtown, Police, Restaurants and tagged "Coffee With a Cop", Aux Delices, Westport Police Department. Bookmark the permalink. 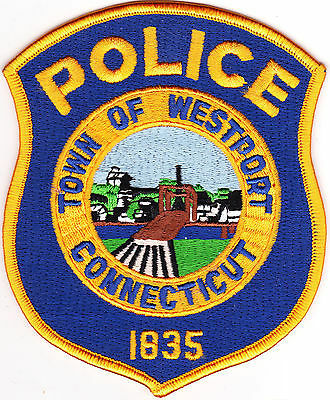 I want to tell you a wonderful Westport Police story. I was stopped for running a red light 5 minutes from home after an excruciating 4hr Friday drive home from the city. Officer Perez asks for my license when I can’t find my pocketbook. He says DO you have one? Yes, Yes, I reply, it was suspended for a ticket by a camera that I never knew about in Vermont but it is all taken care of now. He rolls his eyes and says you know it will come up in the system and walks back to his car. He comes back a few minutes later still rolling his eyes and states, You are right -your license is not suspended, it is expired for over a year. I was shocked and waiting for a big fat ticket- only to be shocked again- he said let your husband drive and go renew your license. I was so excited- I thanked him profusely for no ticket, no warning, his kindness, his understanding, etc. The next day I call the Chief of Police to rave about Officer Perez. Chief Koskinas was not available- I left a message. He calls me back and left a message. He called me back until he reached me. I said I was touched and impressed that he would be so persistent in returning my call on his busy day. His response was we are working on better relationships than we have had in the past and we want everyone to feel good about the department. I can’t tell you between Ned Batlin who has always been wonderful to our family, Officer Perez, Chief Koskinas- I think the Westport police are the finest!!!! !